Traveling in Cameroon is both exhausting and an adventure. I share various scenarios of traveling in Cameroon to give you, the readers, an idea of how traveling in Cameroon is very different from the US and various other countries. Instead of using the term “station,” such as “bus station,” we use the term “agency.” So, if we want to take a bus to a place, we say we are going to a “bus agency.” Many bus agencies do not have a set schedule on when the buses depart. Agencies wait until the buses are overfilled to depart. This means that one can wait for as long as an hour or two before finally departing. Even if a bus is waiting just for one more person to purchase a ticket, it will still wait for one person. I was in a situation where I waited for thirty minutes just for one more person to board the bus. People are waiting in the van for more people to fill up before they can finally leave. The wait time can be as long as a couple hours. Agencies and drivers do overfill their buses and cars. In an ordinary sedan taxi, there can be as many as 11 people inside the car. A few of them would be small children sitting on laps. There can be as many as eight adults in a sedan car. The driver will often have two people in the front passenger seat and another passenger sitting with the driver in the driver’s seat. Then there will be four people in the back seat. The reason they overfill the cars is so that the drivers and agencies can maximize their profit. Buses can also be overfilled too. When there are supposed to be only four people in each row, sometimes there are five or six people in a row. Notice that there is a person sitting between two seats in the front row of a sedan car. Roads come in wide variety of form in Cameroon. There are roads that are paved and very smooth. There are roads that are paved but have clearly not been maintained in a decade and have too many pot holes. There are roads that are completely unpaved. Due to the road conditions. traveling can often be long, exhausting and sometimes perilous. If the entire road between Bamenda and Yaounde was perfectly paved and smooth, the travel time would take less than six hours. However, because one-third of the road which is paved but has never been maintained, the travel time takes eight to nine hours. There is a road that goes from Bamenda all the way directly to the village where Alex lives. If I could travel on that road, which is off limit to Peace Corps Volunteers due to security reasons, I could get to his post in 12 hours during the dry season and in 24 hours in rainy season. It’s important to note that most of that road is unpaved. If that entire road was paved, I could get to his post in three to four hours! I have often talked about how if all roads were paved in Cameroon, the economy of the country would improve greatly as people would not only be able to transport more goods more easily, but also save money on the cost of gas. When I talk to my Cameroonian friends about the road situation, they tell me that Cameroon is definitely working on improving the road situation but they are doing it slowly. I have been told that they are currently focusing on improving the road between Bamenda and Mamfe, known as the Trans-African Highway, as that road is a gateway to Nigeria. They are also focusing on improving the road between Bamenda and Tibati, a town in Adamawa near Alex’s village so that Cameroonians can have an easy access to the Adamawa region from the Northwest region. I have also frequently asked when the road between Bamenda and Bafoussam, the part of the road to Yaounde from Bamenda that is totally destroyed from lack of maintenance, is going to be fixed and the answer is always often that they’re not worrying about that road now because they want to focus on other roads I mentioned above. This video shows an example of a road that has not been maintained and has many potholes. While in the US, when there is a severe snowstorm, school and work often close at the request of the government. In Cameroon, when there is severe rain, there are no cars traveling on unpaved roads. The unpaved roads can also be quite treacherous during rainy season as they become very muddy and slushy. They can sometime be impassable. But, if a driver has some motivation, they can get through by driving slowly or getting the passengers to help push the car. Last month, I was unexpectedly stuck at Alex’s post for an additional day due to severe rain. 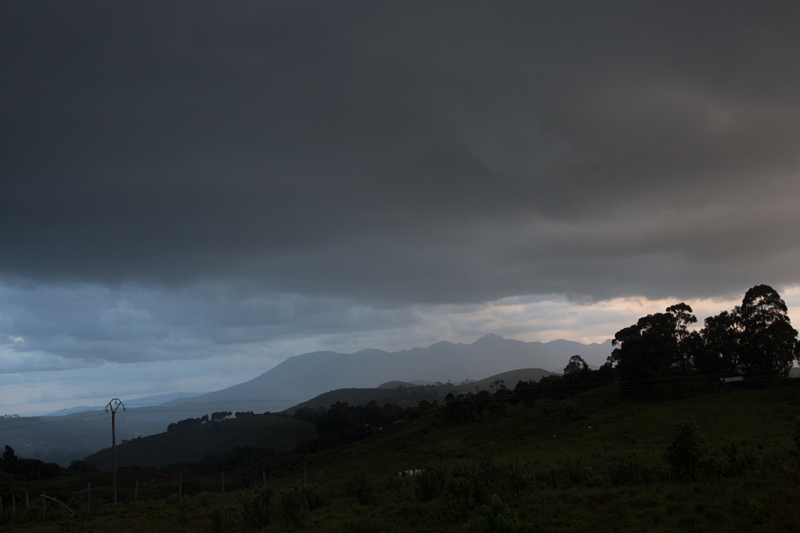 On the day I was supposed to be leaving, rain was pouring very hard from 4 AM until evening. There were no moto-bikes or cars going out of his village to the closest town to catch a car to the train station. Even if there was a moto-bike or car, according to Alex, it was too dangerous to travel on the road as the road is nothing but wet globs of mud putting vehicles in risks of dangerous accidents. Fortunately the pouring rain stopped that night although a little bit of rain still came intermittently throughout the night, and I was able to leave the village the following morning. 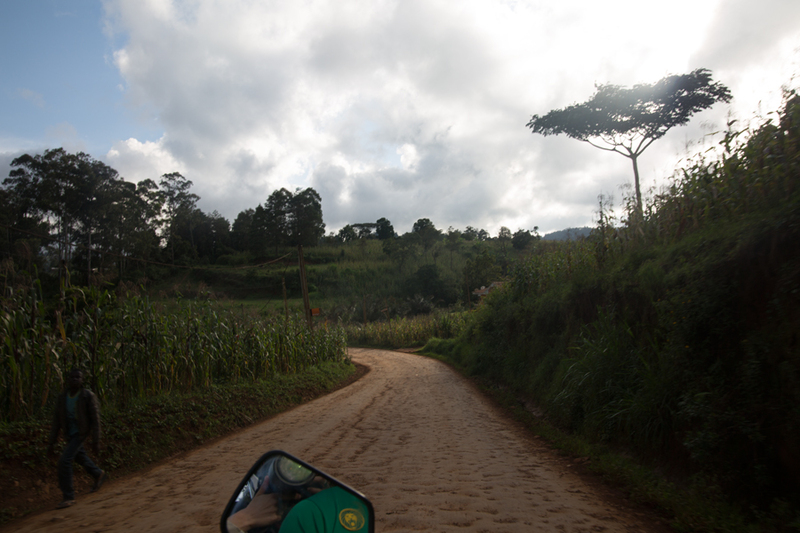 Many volunteers are posted in villages where the only way to access the village is by taking unpaved roads. They have faced situations when cars get stuck in the mud, and all the passengers have to get out and help push the car. There have been times when cars can’t get through and have to turn around due to wet mud. 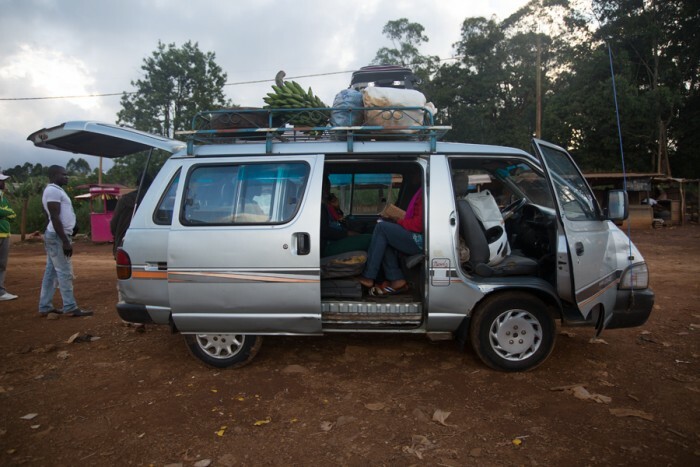 Even when if they can pass through the unpaved road on a rainy day, the price of the car ride can double as the travel time can take much longer, sometimes double or triple the amount of time it takes on a sunny day during dry season. 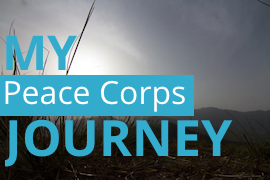 This video by Peace Corps Volunteer Ashley W. shows an example of an unpaved road during rainy season. Majority of the cars in Cameroon are old. Based on the design of the cars, they are at least 20 years old or even 30 years old. Taxis in cities operate similarly to subways. They often run only on main roads and make frequent stops to pick up and drop off passengers. This means that unless one wants to pay a hefty price tag, no one has their own taxi. Because taxi drivers want and need to maximize their profit, they fit as many people as they can in a car. This is what a typical taxi ride can look like: I flag a taxi. There are already two people in the car. I tell the driver the destination. If the driver is going in the direction of the destination where I want to go, the driver will honk a horn signaling me to get in the taxi. If the driver is not going in the direction of the destination, the driver drives off. So, if I get in the taxi, the taxi can stop again after a half mile of driving to drop off a passenger. Then the taxi can stop again after another half a mile to pick up another passenger. Then the taxi can stop again after another mile of driving and pick up another passenger. Then I can finally arrive at the destination. Then I have to sometimes walk to the place where I want to actually be which may not be on a main road. 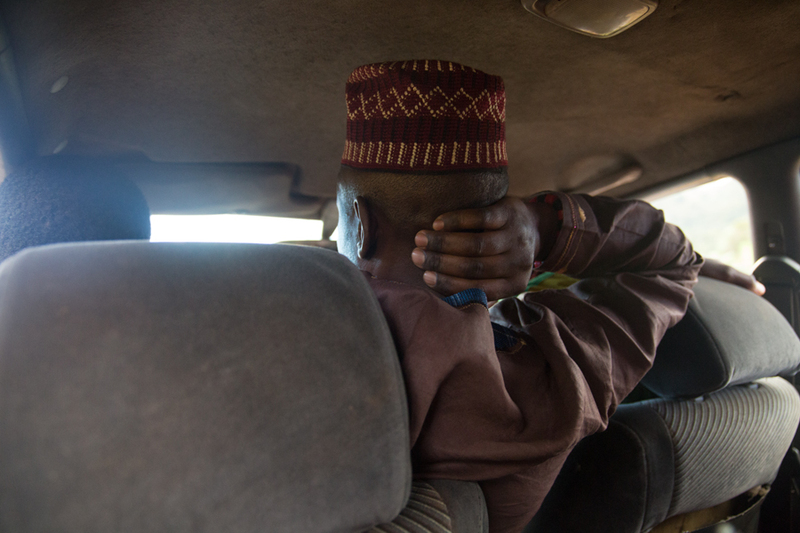 The taxi rides can often be slow and long because they make so many stops. Moto bikes is a very common mode of transportation. It is often preferred in the cities when one wants to get from one place to another place without being dropped off of a main road and having to walk to the destination. If one doesn’t want to face the long ride with many stops in a taxi, the bike is also preferred because they can reach the destination faster. Riding through the beautiful countryside on a moto bike. There is no traffic lights except in Yaounde and Douala. There isn’t even a traffic light in Bamenda, the third largest city in the country. While there are roundabouts, the drivers have to be very defensive by making left turns carefully and crossing four way roads. At the four way roads, which can be called four way stop, there are normally no stop signs although if there is one, all ignore it. There is no pedestrian crossways except two in front of a hospital in Bamenda. I have not come across crossways elsewhere in Cameroon. Waking to the other side of the road can be nerve-racking. One has to run the other side of the road to be able to cross because pedestrians often do not have the right of way. There is a train that runs south and north. For those living in the Grand South region, it serves as the gateway to the Grand North and for those living in the Grand North, it serves as the gateway to the Grand South. The train has three classes: Wagon Lit (Sleeper Car), First Class and Second Class. 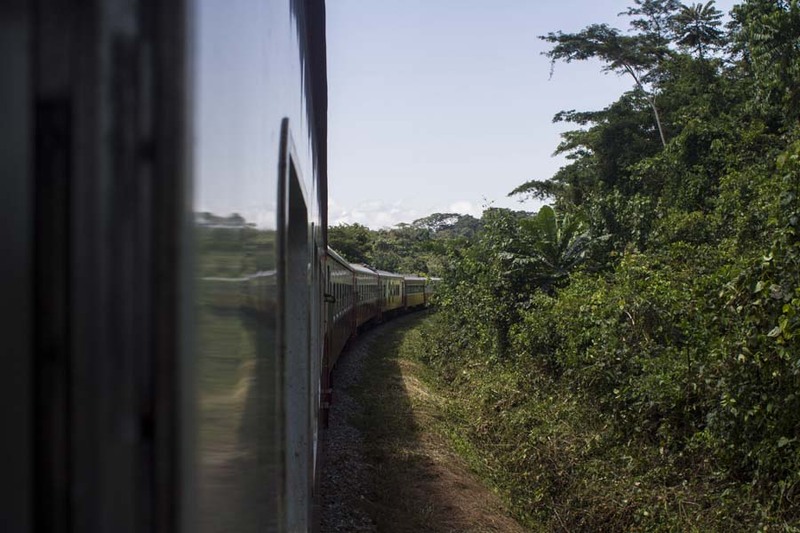 To go to and from Yaounde and Ngaoundere, it takes 14 hours. While the train is well built from the inside, it can often break down. Because there is only one train going in each direction, if the train breaks down, there could be no train for at least 24 hours. However, in spite of travel difficulties, we’re often treated with most incredible views of Cameroon while traveling.